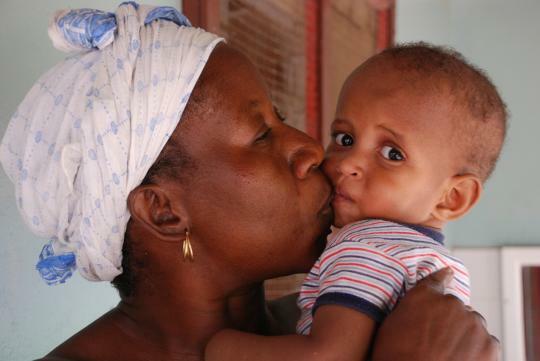 Omar, now two years old, came to SOS Children's Village Bakoteh very pale, ill, weak, weighing less than two kilos. Today, he's strong, healthy and about to start school in September. Omar was referred by the Gambian Department of Social Welfare to SOS Children's Villages The Gambia by the end of 2008. He was just two weeks old when he was admitted at the baby transit home in SOS Children's Village Bakoteh. Today, no one in the village believes how such a small and weak baby can still be alive. When he arrived at the village, his behaviour could actually tell he was undergoing some severe trauma. His biological mother, a mentally ill woman, could not care for him, nor could she breastfeed him properly. With no one to feed him adequately and provide the love and care he needed during those early days, Omar was striving to survive. He became very ill and started draining down because of a lack of proper attention. Like any child, he needed food, shelter and above all love and care to stay healthy. Luckily, the Gambian Department of Social Welfare intervened in time and found a solution for this innocent child. Omar began a new life from the day he was admitted to SOS Children's Village Bakoteh. He temporary lived in the baby transit home, from September 2008 to February 2010, until he was transferred to a family home, under the care of SOS mother Marie [and 'auntie' Naffie, the family helper]. Omar is now an active, healthy, charming and loving child, now enjoying the rights every child deserves. When he is not cuddled by his SOS mother or any of his two older brothers and five sisters, Omar likes to spend his time with his special teddy bear; a teddy that sings. 'He also loves cartoons and one can see him laugh and jump around!' says Naffie, the family helper. Marie, his SOS mother, is very attached to him. She explains that Omar will soon be attending the SOS Kindergarten. 'For the past days I've been explaining to Omar that, very soon, he will spend his mornings there, to play and learn things', says Marie. 'It will be not easy for me to be separated from him, but I know it's for his own good!' she concludes. Thanks to SOS Children's Villages, Omar is now in safe hands. He still has a long way to go to become a strong independent man, but first, he needs to enjoy every bits of his 'new' happy childhood!